Environmental Protection Agency Administrator Andrew Wheeler yesterday announced the approval of sorghum oil as an eligible feedstock under the Renewable Fuel Standard during a signing event at EPA headquarters in Washington, D.C., with sorghum farmers and other stakeholders. In December 2017, the EPA released a notice of proposed rulemaking (NPRM) concerning renewable fuels produced from sorghum oil under the RFS program followed by a 30-day comment period. EPA’s analysis showed biodiesel produced from sorghum oil has greenhouse gas (GHG) emissions savings of 82 percent. This will give ethanol plants extracting oil from sorghum access to sell into the biodiesel market. In addition to the nine ethanol producers already extracting oil from sorghum, several other facilities will now be able to purchase and use sorghum. 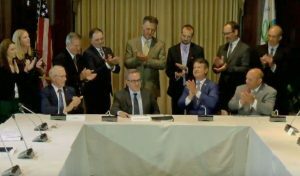 Among those present for the signing who made comments were Sen. Deb Fischer (R-NE), National Sorghum Producers CEO Tim Lust, American Farm Bureau Federation president Zippy Duvall, and sorghum farmers Dan Atkisson of Kansas, Bobby Nedbalek of Texas, and Kody Carson of Texas.